William Niskanen advocated targeting nominal expenditure on output. However, he favored using Final Sales to Domestic Purchasers. While I advocated Final Sales of Domestic Product for some years, last February, I came to see that nominal GDP is the least bad measure of money expenditure on output. My post from last February (subtitle, Scott Sumner is right) is here. Final Sales of Domestic Product is nominal GDP less inventory investment. The benefit of using Final Sales of Domestic Product is that unplanned inventory investment is not included as demand. With nominal GDP, goods that are produced with the intention to sell are counted as being "demanded" by the firms that fail to sell them. The primary disadvantage of using Final Sales of Domestic Product is that planned inventory investment is not included either. Planned inventory investment is important because it is the only way that the demand for intermediate goods is included. For example, a rapid increase in the demand for "commodities" is largely a demand for intermediate goods. The increase in prices and quantities will show up as inventories. 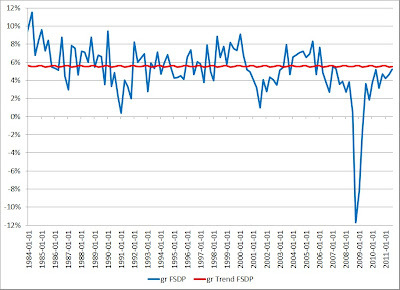 Second, while stabilizing nominal GDP growth does imply unstable growth in final sales, this can be desirable when the demand for final products expands so that planned inventory disinvestment uses up unplanned inventory investment from a past period. A secondary problem is that Final Sales of Domestic Product can show a rapid increase due to disinvestment of inventories of imported goods. While current imports are subtracted from Final Sales of Domestic Product, inventories of those goods accumulated in the past are mixed with other inventories. Niskanen, however, favors a third statistic, Final Sales to Domestic Purchasers. This takes away inventories, adds imports, and subtracts exports. Rather than measure spending on goods and services produced in the U.S., it is measuring spending by U.S. residents on output wherever it is produced. In my view, nominal GDP targeting generally requires more exchange rate changes for external balance than Final Sales to Domestic Purchasers targeting. Final Sales to Domestic Purchasers targeting requires more adjustment in domestic nominal income, but allows for smaller adjustments in exchange rates. Neither approach requires, or really allows, active exchange rate management. Base money controls some measure of nominal expenditure, and market forces determine exchange rates. However, if trading partners want stable exchange rates, then nominal GDP targeting requires more domestic adjustments for them. Rather than explore these differences further, I want to first explore how much difference the two targets make in practice. the growing trade deficit. The slower growth in nominal incomes includes slower growth in nominal wages. This should reduce unit costs for U.S. goods, improving the competitiveness of U.S. products both as import competing goods and export goods. With nominal GDP targeting, this is simply not an issue. As long as spending on U.S. products doesn't outstrip the productive capacity of the U.S., Americans can import what they like. If foreigners are willing to fund a trade deficit by accumulating U.S. assets, the monetary regime doesn't restrain expenditures. If, on the other hand, the foreigners spend their dollar earnings on U.S. products, this added demand for U.S. output would require monetary restraint so that total spending on U.S. products does not outstrip the productive capacity. U.S. imports would be brought into alignment with U.S. exports. There is not much difference. Final Sales to Domestic Purchasers does show a slight deviation above trend in 2006, which makes no appearance in nominal GDP. But what is most striking is that both approaches clearly show the disaster of the Great Recession. A massive and growing deviation from the trend of the Great Moderation. 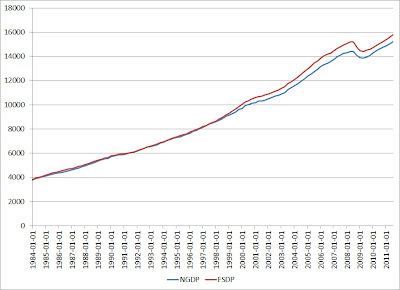 Using the trend shown here, the deviation of Final Sales to Domestic Purchasers from trend is nearly 15 percent, while the gap of nominal GDP from trend is a mere 14 percent. The growth rates of the two series track closely. The growth rates diverge in 2005 and 2006, reflecting the "boom" in Final Sales to Domestic Purchasers that did not show up in nominal GDP. The trend growth rate for Final Sales to Domestic Purchasers is 5.5 percent, slightly higher than the trend growth rate of nominal GDP of 5.4 percent. Otherwise there are few significant differences. While further study is useful, and the difference between demand for U.S. output and demand by residents of the U.S. for output would seem significant, at first pass, there should not be too much difference between the regimes. I agree that NGDP should be the "target". 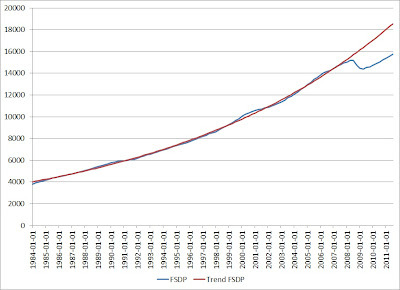 With regard to FSDPurchasers, the differences that show after 1997 have to do with the Asia crisis and the fact that the US became the "buyer of last resort". But that was the "equilibrating mechanism" in play. If the US were to restrain FSDPurchasers, the "mechanism" would have worked less efficiently and the Asian crountries in crisis would have had an even harder time. We got to be good at measuring the GDP, as only then we will be able to work it out brightly. I am able to do it all pretty much nicely thanks to one of the best in the industry OctaFX. They are very special having lowest possible spread from 0.1 pips to high leverage up to 1.500 while there is also smooth trading platform in cTrader, it’s all very special and helps work out ever so smoothly, so that’s why I am able to do it all easily. 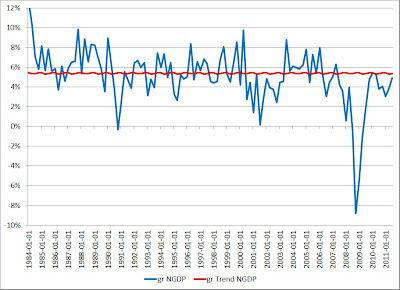 Nominal GDP Targeting in 1982? 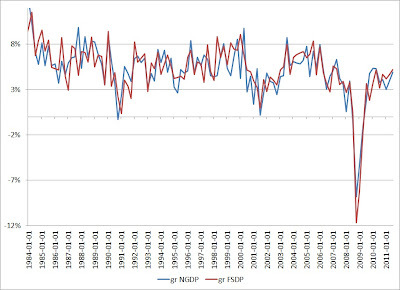 Nominal GDP Targeting and Supply Shocks: Again. 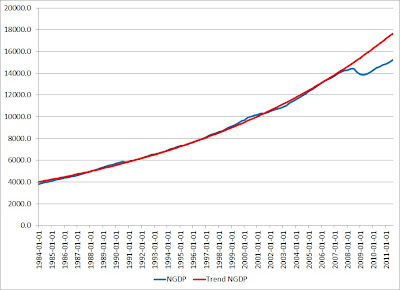 Does Nominal GDP Targeting Imply Instability?